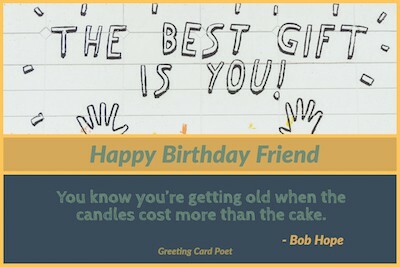 Nothing says “Happy Birthday Friend” like a thoughtful message, quote or text. 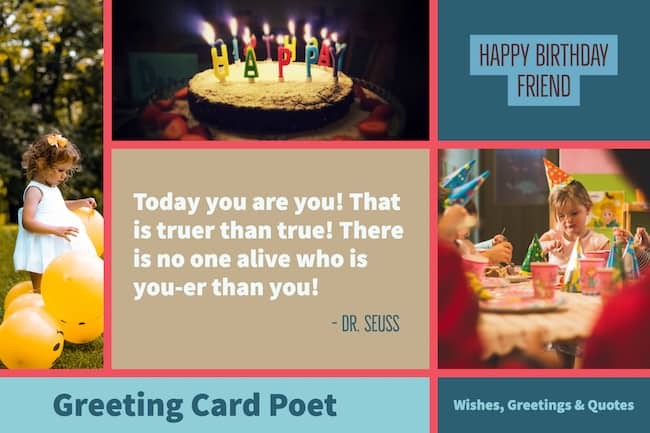 It’s a fun day – cause for celebration – for someone close to you; make it special with a well thought-out greeting. There are lots of options to choose from below. Find one that resonates with you and make it your own by personalizing it. Every step of the way you were there for me. Through thick and thin I’ll always be there for you. Happy b-day! Thanks for another year of being an good friend. May your special day be filled with lots of gifts, love, wonderful memories and of course a big cake! You are gradually getting to the top of the hill. It’s better than being buried under it. Happy b-day, my great friend. My birthday gift for you is my wish for your long life, and I’m sure you love that wish. But, let me warn; the day you start buying anti-aging cream, you may intercept the long-life wish, because aging is the only way to live a long life! How old are you today? That’s weird; I could have sworn you were only about 5 years old based off of your mental age! So, it’s another birthday with you. Statistics prove that those who have earned more birthdays, have lived the longest life in the earth. Don’t worry about the increasing wrinkles, you should rather be grateful for your blessings. So, you are still younger than the age you will be on the next birthday. Have a special celebration. Happy b-day to my lovely buddy. The best facial makeover as you get older is smiles all the way. Another year has gone, but that doesn’t mean you’ve become wiser. Happy big day! There’s one thing that can definitely make you live long and enjoy long life, and that is aging. So, don’t be afraid to age, it’s the best prescription for long life! A great b-day to a wonderful companion. It’s your big day. Have a buffet cake night and eat as much as you can. If you find your new age hard to swallow, just add some… Tequila! Have a friend happy birthday! See how many candles on your cake. You’ll have to blow them out only by sniffing. Have an amazing b-day! Sweetheart, the older you are, the wiser you become. How about expediting your age, so that you can become the wisest person on earth? Best wishes on your big day. Hey, no matter how old have you become today, just make sure that you don’t forget that where you kept the car keys. Happy birthday! HBD to a friend who is lucky to be blessed with the most phenomenal friend in the world! Dang! I envy you! Is it just me, or do you seem older? Oh, right. You are older. Happy bday! We are friends for several years now and I am very happy because I have you in my life. You are a wonderful friend and today, on the day of your birthday, I want to wish you all the best. Today is your birthday, but remember to not grow up too fast. On the day of your b-day I want to wish you all the best and that happiness, success, love and health accompany you on every day of your life. I am so glad that I still get to be with you for yet another year. One more year of life is another chance to be happy and enjoy this wonderful world, so feel proud to be celebrating your birthday. I wish you all the best my good friend! Today is a reminder that you are still alive; don’t ever take that for granted. You might want to check out our HBD puns. My dear friend, I send you the best vibes and wish you all the best on your special day. I hope you have a very happy time next to your family. I hope that when you blow out the candles on your cake all your wishes can come true, you are a great friend and you deserve only the best in life. HBD! We are all so blessed to know such a wonderful person like you. God bless you on your b-day. With you by my side, life is much funnier; you have an excellent sense of humor that makes me very happy. I want you to have an unforgettable bday. Today is a gift, not just for you, but for all who know you. Today is a very special day and that is why we will gather together to celebrate a happy woman. HBD dear friend! Hey, I heard it’s your birth date today! Make sure you make today the best day ever! Have a very special day! I am very happy to have the joy of sharing with you one more year of life and celebrate it in style because you deserve it. Happy Birthday bosom buddy! With mirth and laughter, let old wrinkles come. 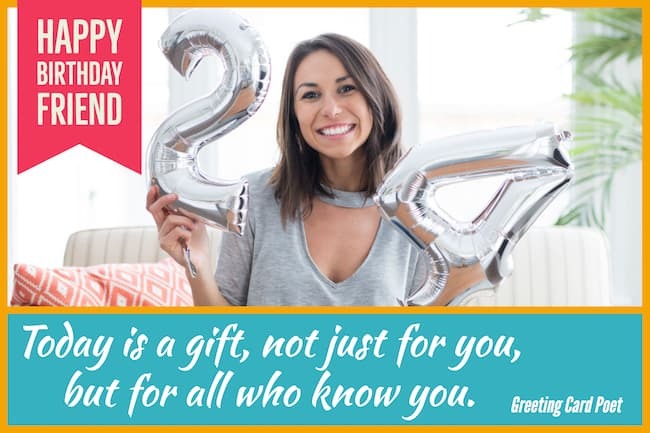 Tip: some of the these happy birthday friend quotes work well for captions on social media. There are so many reasons to celebrate this day, so many ways as well, one, being your special day for my friend. To the most amazing person. You make my every day brighter. HBD! Happy b-day to you, my pal, who never fails to be kind to every person that you meet, I salute the things you do and those things are what makes you special. Your best friend can play the perfect soundtrack in your life’s reality show. I’m so glad that you are in my life. Generosity can bring you so far and it was proven true especially by you, my buddy, for you give to others without expecting anything in return, HBD to you! Your simple hug has wiped my tears many times and your simple laugh has brought happiness into my face. You are my best friend. I believe you’ll always remain as throughout the life. I don’t want to lose you. Friends know how to care and love. That’s why they are so important in our life. Wishing a very special day to that person whose presence in my life means a lot. Thanks buddy and have a wonderful bday! Buddy, you are my true partner and you keep getting better and better. Thanks for all the memories you have to me. May be tonight you’ve become a year old, but still you are my true and best buddy. I feel so lucky to have you as my friend. Hope your birthday is as special as you are. May all of your dreams come true. Happy bday to my best friend! We are such a great team: I am smart, good-looking and talented and you are great at being my friend! Just joking! I am looking forward to many more years of friendship and birthdays with you. Have a fantastic b-day! HBD to my best buddy, the one who laughs at my silly jokes and still stands beside me even when I do dumb and stupid things! This is the day when my best buddy came into this lovely world. I’m so lucky that God sent you in my life. HBD! No matter what happens in our life, we’ll still the same best buddies forever. Happy b-day! Wishing happy birthday to that person who can easily turn my tears into a laugh. May all the dreams of your life will come true in this coming year! In good times and bad, I’ll always be by your side. Happy b-day partner! You understand me like nobody else. I have a sibling in you my friend. Happy birthday! You deserve all the cakes, love, hugs and happiness today. Enjoy your day my friend! Your presence in my life means a lot. I’m so glad that you are still in my life. I am grateful for your true friendship. Hope your b-day is amazing as you are my best buddy! Family cannot be chosen, but friends can be. I’m very lucky that I’ve chosen the right person to share everything. Wishing you a gorgeous bday. This is always my favorite day. I get to wish the best person ever a happy birthday! You’re on Happy Birthday Friend page.